Bestsellers. Award-winners. Superstars. This anthology has them all. With brilliantly entertaining short stories from beloved young adult authors Amie Kaufman, Melissa Keil, Will Kostakis, Ellie Marney, Jaclyn Moriarty, Michael Pryor, Alice Pung, Gabrielle Tozer, Lili Wilkinson and Danielle Binks, this all-new collection will show the world exactly how much there is to love about Aussie YA. I love this anthology! All of the stories (and the chosen writers) gel really well together and it’s really nice to see a focus on Australian young adult fiction. This anthology features some really well-loved Aussie writers, well-known for their novels and their trilogies. I would’ve liked for it to feature perhaps one more debut writer (in addition to Danielle Binks) because this anthology would’ve really helped them kickstart their writing career and would be a great way to introduce YA readers to another fresh, unpublished voice. I’ve broken down my review and posted about each individual story in the order in which they appear in the book. This is a sweet story set on Mars, about a young girl whose parents are encouraging her to continue her school education on Earth at any one of the prestigious universities who have recently offered her a place. She’s not sure what she wants to do, so she hasn’t made a decision yet. Also, she happens to be in love with her best friend and doesn’t know if she should tell her. She doesn’t know if her friend feels the same way. This short story is really well-paced and quite enjoyable. The characters are really relatable and the romance between the two girls is really sweet. I must admit, it did feel a little self-contained for a short story. I got to the end of the story and felt like a lot of things were wrapped up, and I didn’t have any burning questions (which is something I thought short stories usually encourage?). I also thought that the story should’ve been a bit longer. So much happens in the story (plot-wise and character-wise) that I felt like a higher word count was needed to really give the story more room. It’s really well-written though, and I enjoyed reading it. I think fans of Amie Kaufman will love it for its setting and also for the high-action plot. This story has such an adorable concept! It’s about a boy called Adam who gets glimpses of the future and can sense how things will play out. Once day, when hanging out with his colleague Nina, he foresees that the two of them will get married but will then later get divorced. Adam thinks that he should perhaps change fate. Perhaps he should not get into a relationship with her at all if it’s just going to end in heartbreak? Adam really struggles to understand how he’s supposed to use this gift he has. This short story is the perfect length. It’s enjoyable, and it’s the perfect balance of character-driven and plot-driven. There’s fantastic character development and the premise is really unique and engaging. The story still leaves plenty of things open so that you are left wondering — you want to keep reading about these characters. I Can See the Ending also provides enough information to keep you entertained. I loved this! This was probably one of my favourite stories in the anthology. It’s written in second person and is written like a letter from a pregnant teenage girl named Kim to her unborn child. It’s a very empowering story because in a way, Kim’s story parallels with her mother’s story — Kim’s father has left them and since then, her mother has raised Kim on her own. In A Heartbeat illustrates that you don’t need a man in your life to succeed, and that there are women out there who are strong, resilient and inspiring, and they’re single mothers too. Kim learns that the baby’s father Luis (and his parents) don’t want to be in the child’s life because it might harm his career. And then Kim comes to the realisation that she really doesn’t need him anyway. In A Heartbeat also illustrates how courageous and brave Kim is, and how much her mother loves her and supports her (despite how disappointed she is in Kim for the unplanned pregnancy). Kim is constantly being told what she can and can’t do and yet she’s strong enough to know that she can make her own decisions, despite the fact that the odds are stacked together. We also realise that if someone lets you down or isn’t there for you, then maybe it’s better that you let them leave rather than forcing them to stay. I felt like there was only one flaw in the story, and that was the interwoven switch between past and present. Kim often tells stories about the past and the transition between past and present was a bit clunky. I often found myself a little confused because the constant switch between tense, along with the piece being written in second person, made the story a little jarring at times. But overall, I really really loved this piece and thought it was brilliant. This is a suspenseful short story about a holiday trip (in space) that goes horribly wrong. It’s an interesting concept and I didn’t mind it. It may not have been my favourite story of the anthology, but I found it quite enjoyable to read. The writing is great – engaging, entertaining and at times witty. The characters are fun to read and the story is quite plot-driven. There’s a lot happening in the story and it keeps the reader interested. In the middle of the story, I did feel like the pace dropped off a little bit (and it felt a little dry at times), but it picked up again towards the end. Melissa’s story is about a group of teenagers at a party that stretches over one long night. The main character, Gabrielle, seems to be clinging to her best friends because her home life isn’t that great at the moment. Her two friends Cameron and Claire have been dating for years — since primary school. But at the party, Claire tells them that they’ve broken up, and then Cam is seen kissing someone else. But Claire is happy, and she’s ready to move on. Although, it appears Gabrielle and their other friends aren’t quite ready yet. This has quite the unique premise because it’s not the usual characters or storyline — it’s an interesting take on teenage relations. It speaks about relationships that perhaps still exist not because it’s right, but because it’s always been that way. Sundays will resonate with teenagers because it allows them to let go of the past and let go of what they’re desperately clutching to and embracing. It’s important to note that not everything is set in stone. This was written really well, with hilarious characters and plenty of wit and humour. This is about a young girl — Rachel — who moves from the country to Melbourne with her family. Missing Persons spans a number of weeks, allowing us to read about Rachel experiencing the first few weeks of school and making friends. It’s like a coming of age story and a story about a teenager trying to fit in to her new and unknown surroundings. I thought this was a sweet short story, touching on something that I think a lot of teenagers experience: adapting to new surroundings and learning to make new friends. I felt like there should’ve been more development with her relationship with her parents and her brother. Besides that, I think Ellie did a fantastic job with the pacing of the story and the friendship between Rachel and Mycroft. Amazing. One of my favourite stories of the anthology. It’s about two young friends who venture underground to find a witch who can answer any burning questions they may have about their lives. It’s a little magical and a little real and together, Lili has moulded an amazing short story that is lyrical, poetic but also wildly entertaining and unique. Out of all the stories in this anthology, Oona Underground is the story that says the most, but also leaves the most out of it at the same time. It keeps the reader guessing — it keeps them engaged and interested and enraptured. This story is an exploration of love and hope and destiny, but it is also a little paranormal and magical. Loved it! This short story is about Lucy and Cameron, two young teenagers (with a complicated history) who both happen to be on the same bus ride from Canberra to Melbourne one night. They haven’t seen each other in years, not since Lucy and Cameron were at the same high school and they kissed each other at a party. And then Cameron became popular, and Lucy was bullied by Cameron’s friends. The story takes place over one long bus ride between the two cities, where plenty of drama happens and many things force the two of them to acknowledge the other. We experience both Lucy and Cameron’s perspective and we come to understand how they feel about each other and about how things unfolded the last time they were together. That Feeling From Over Here touches on the hurdles of high school and how bullying can resonate with someone years later and how someone who doesn’t mean to can actually play a large part in the bullying. I think there is one small flaw in the story, and that is the text messages that Lucy is sending her friends. Lucy messages her friends quite a few times in the story, but they don’t reply. The messages were a good way for the author to know how Lucy was feeling (at first, she sends her friends an SOS text when she realises that Cameron is on the same bus as her), but I think Gabrielle could’ve easily woven Lucy’s feelings into the prose of the story. I felt like the texts really weren’t necessary and probably could’ve been cut from the entire thing. This was one of my unexpected highlights of the book — a touching story about siblings and their strong bond. Bowie is a fourteen-year-old girl who idolises her older brother King, and she’s quite sad that he’s about to leave their home town Orianna and travel the world. She follows him one night when he goes out to hang out with his friends. It’s actually his last night in the town, and she wants to be a part of it. He lets her come along with him and his friends as they go to to the Mount Solemn Observatory. Last Night at the Mount Solemn Observatory is a fantastic short story and a really great snippet of a much longer piece. I felt like I wanted to know more about King — I would love to read a longer piece about his travels overseas and his adventures abroad. I think it would make a great YA novel. Danielle’s short story captures that sibling relationship perfectly. On the one hand, your younger sibling can be quite the embarrassment when you’re around your friends. But on the other hand, you’re glad to have the company and there’s a closeness there that you relish in. The pacing was on point and the characters were so full of life and three dimensional. I loved reading about all of them! What a quirky, hilarious, scrumptious short story! I’d read a lot of people’s reactions to this anthology before I picked it up, and a lot of people were stating that Jaclyn’s story was one of their favourites. And I’m so glad it is the story that ends the book, because it’s probably the most fun. What a way to conclude the anthology! In this story, a young girl enters a competition to win a time-travel package at the Time Travel Agency. Her answer, which is supposed to be twenty-five words or less, is actually about forty pages. As it turns out, she’s already been to the Time Travel Agency for school, and she feels like she needs to redo her experience. Earlier that morning, she’d been there and instead of going back in time to the early 1900s like most of the kids in her class, she went back a few weeks to the time that she’d kissed Noah in her bedroom and then he’d left her house and never called her again. She wanted to know what she did wrong and why he had been pretending to ignore her since their kiss. It’s sweet, but this is also a truly hilarious story. Jaclyn Moriarty is a wonderful writer, with poetic prose and lyrical writing and she somehow manages to mould together the most beautiful of sentences to make the perfect story. Reading her writing is always such a joy. 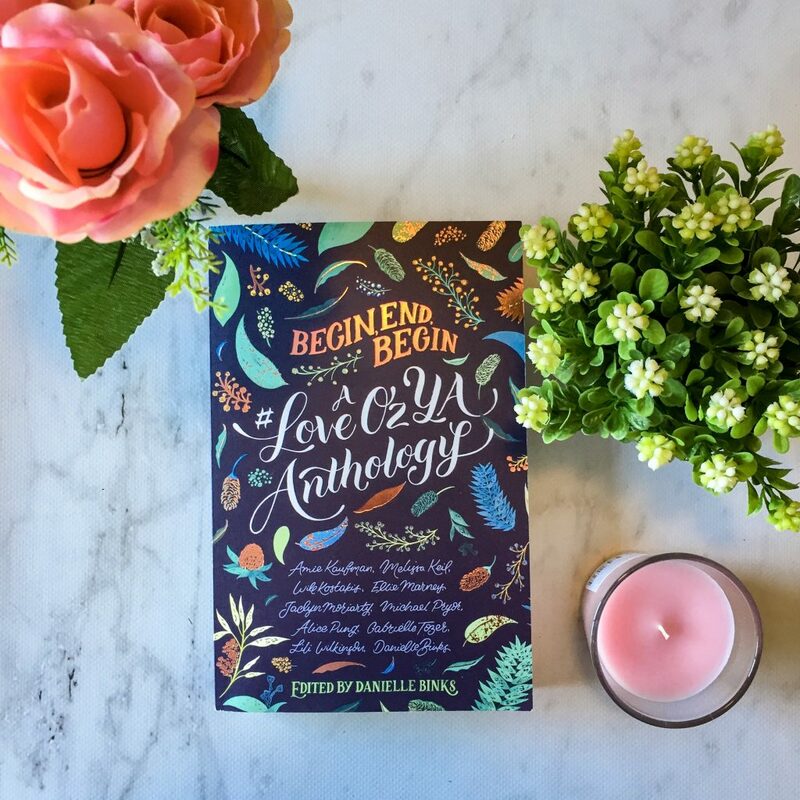 I am so glad you loved the Anthology, as much as we all loved creating it for you! Wow. Your review was so well written! I wasn’t quite as diplomatic in my own. I still think that short stories are the most difficult thing to write and get right, you need to quickly develop characters that the reader will actually identify with and care about, and have an engaging plot. I really did love this anthology and I am certain I will be revisiting a few of these in the future! Cass (Words on Paper) recently posted…I’m aliiiiiiiiveeeeeeee…….